General Characteristics: Medium in height, slender, erect, maturing within 9 to 12 months, producing from 2 to 5 oha; recognized by its blackish petioles with inconspicuous narrow reddish edges. Petiole: 70 to 90 cm. long, blackish, with inconspicuous narrow reddish edges, greenish at apex, a dark pink ring at base with light pink for 2 to 3 cm. above. Leaf blade: 45 to 60 cm. long, 30 to 40 cm. wide, 35 to 45 cm. from tip to base of sinus, sagittate, dropping, thin in texture, dark green with bluish cast; margins slightly undulate; piko small, purple; lobes obtuse to slightly acute with medium-cut to deep, narrow sinus. Corm: Flesh white with lilac at apex, the fibers yellowish; skin lilac-pink, often dark purple along leaf-scar rings. 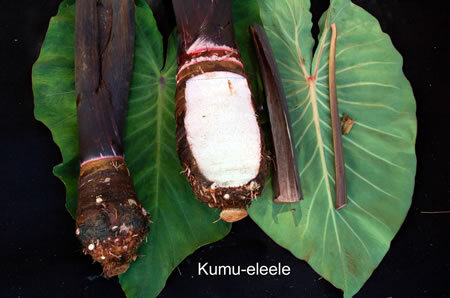 Origin, and derivation of name: Native variety; Kumu refers to dark pinkish tinge of corm, similar to color of the Hawaiian fish, and eleele refers to blackish color of the petioles. Distribution: Rare; collected by Dr. E. S. C. Handy from Olowalu, Maui. Use: Chiefly as table taro.